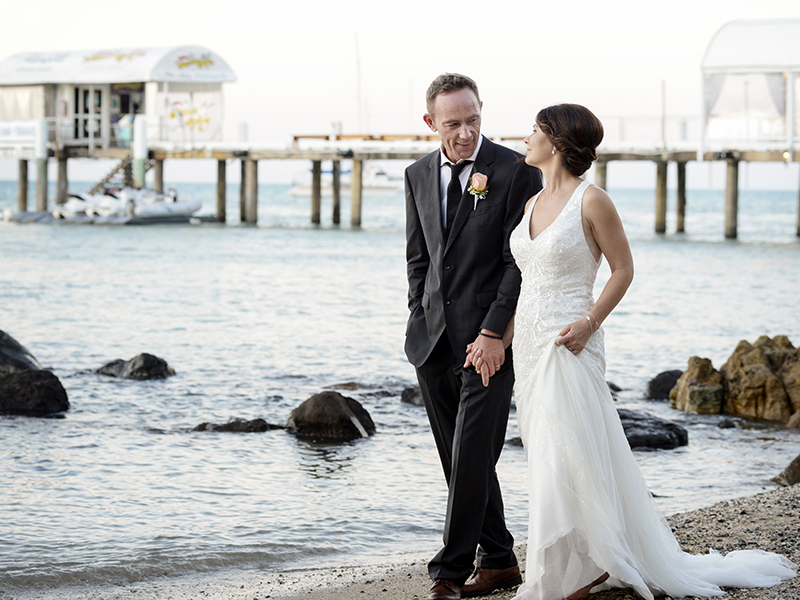 AN OCEAN WEDDING ON AUSTRALIA’S GREAT BARRIER REEF! Cara and Lloyd started out as colleagues on a super yacht before a dinner date onboard the Black Pearl restaurant, moored in a marina in Malta, saw their friendship spiral into something more. “Lloyd proposed to me on the top deck of the yacht when we had just sailed into New York. The captain had dropped anchor in front of the Statue of Liberty. It was such an amazing moment,” gushes Cara. Even better, the groom had craftily planned for his best friend, a fellow crew member, to be poised and ready with a camera. Of course, with such an iconic, jet-setting proposal, it only made sense that Cara and Lloyd choose a dream destination for their wedding too – Australia! After the “I do”s, the couple and their guests tucked into a barbecue buffet, featuring sirloin steaks and tandoori-marinated chicken. Salmon and calamari in a cream pesto pasta, gratin potato bake and spiced vegetable couscous offered tempting side dishes, alongside a selection of salads. “Senses Events took care of the styling, colour scheme and planning for us. Paola, our planner, did a brilliant job organising our wedding. She has a great eye for detail and ensured every last thing was perfect. Flower Hut took care of all the floral details. “My bouquet was an unstructured posy of Miss Piggy roses, coral snapdragons, lime button chrysanthemums, apricot wax flower and coral gem cluster roses, all tied with a white ribbon.” Coral roses and fern leaves formed tropical-inspired corsages for the bridesmaids. The couple chose a two-tier caramel mud cake, decorated in fondant, for their wedding cake. A peach ribbon and fresh orchid blooms decorated the tiers in another nod to their exotic destination. An acoustic musician played relaxed tunes, adding to the laid-back beach atmosphere.